So I had a very quiet blogging week last week. I only posted two blog posts when generally I average three or four (and sometimes even five) a week. I have only been blogging for four months but it was the first time that my schedule ran away from me and I was so off track that I ended up posting an empty blog post which I thought I had completed yet I had not even started on it yet. I think when I started blogging I was just SO excited and I had much to say that I would post as soon as a post was ready but I am definitely going to try and keep it regular and to scheduled days from now on. That being said, I am happy that I post too much and not the other way around! 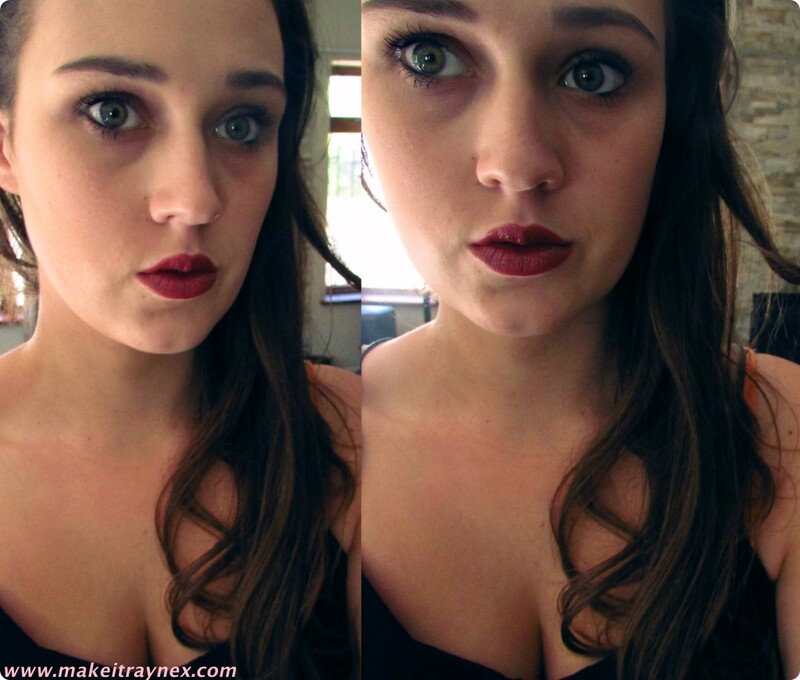 ANYWAY so today’s post is my seventh lip look, and it is on the Face Of Australia Lip Quench Lipstick in Urban Spice. This is one of those lipsticks that I am such a sucker for because of the packaging. I guess it isn’t anything special but its classy to me. Sleek black bullet with a silver strip, crisp white lettering, a colour sticker with the name on the bottom and the lid is see through so that you get a peek of the colour. I tried to capture the lid in a photo but the lighting was soooo crappy and it would not show up properly. But hopefully you get the picture. The colour is a rich mahogany with a deep red undertone. It kind of reminds me of the colour that ladies would wear in the 80’s and 90’s as every day lipstick. It has a slightly powdery smell and the formula is sleek but not cremesheen. It also contains an SPF of 30 which freaked me out a bit because last time I used a lipstick with a high SPF I could actually taste sunblock on my lips and it completely put me off that brand for ever, but in this case there is not a hint of sunblock. Face Of Australia are 100% against animal testing and it is the first thing listed on their sticky label. I found this colour only lasted me about two hours before needing a touch up and I did not need a lipgloss over it as it did not dry my lips out at all (BIG plus in my eyes). It does not leave any colour reside stains on my mouth, which is another plus for me, although I know that some people prefer that. I would give this lippy a thumbs up and I will most certainly be wearing this colour during our upcoming Winter! Have you used any Face Of Australia lipsticks before? What did you think? I like the packaging too. Not too flashy and not lame! Scheduled blogging has helped me a lot. When I started out and now I decided on my schedule and then I just write down my blogging ideas so that I will hopefully always have something to write about.